Folks on Twitter follow influencers and key experts in the industries they are interested in. It is vital for you to establish relationships with your industry leaders so that industry leader’s followers (your potential customers) can learn about your brand through a resource they trust. Connect with journalists and bloggers who cover your industry. Use technorati to identify and start following influencers. Pitch to influencers on Twitter. Do not pester; be subtle. Be brief and concise in your personalized pitch. Leave comments on influencer’s articles. Use your original content as an outreach tool. Help influencers with their research by posting useful content on their twitter page. Do not follow too many people at once. Your following: follower ratio will look imbalanced. 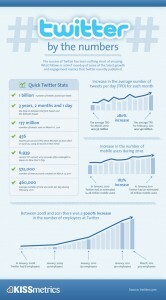 Twitter has a strong presence of early adopter who tend to be the first to purchase the newest products. Following these thought leaders will help you find the inspiration for your own content creation, while also providing you with the chance to get in touch with active consumers in your industry.